A Cayman Brac liveaboard will usually be part of an itinerary which incorporates diving around all 3 of the Cayman Islands. Cayman Brac - the second largest of the three Cayman Islands - is named after its most recognisable feature, a rugged limestone bluff (or 'brac') that runs up the center of the island like a spine, gradually rising 140ft above sea level to form a dramatic cliff face that looks out across the eastern shore. A nature lover's paradise, it is the island's natural beauty and unique limestone formations that beckon many of its visitors. Rock climbers and cave enthusiasts seek out the island's many caves, caverns and arches that have formed within the sheer limestone walls. Hiking trails offer visitors the chance to encounter some of the island's native wildlife such as the iconic Cayman Brac Iguanas, often seen sunning themselves in the early hours of the morning. This little island is also a strategic resting spot for many migratory birds, with parrots, brown boobies and the impressive frigates being just some of the sought-after species easily encountered here. Liveaboard diving in Cayman Brac takes divers beneath its crystalline turquoise waters where you will find walls and reefs brimming with colour and bursting with life. The world class wreck diving offered here is a must for any dive trip to the Cayman Islands, the most famous wreck being that of the 330 ft long 'Russian Destroyer #365', which has since been renamed 'Captain Keith Tibbets' in honour of a local politician and dive operator. This former warship is now home to a multitude of vibrant and colourful marine life - Schools of Horse-eyed jack, scorpion fish, grouper, barracuda and a resident Green Moray eel known as 'Charlie', are just some of the photogenic marine life you can expect to encounter here. Keith Tibbetts/ Russian Destroyer #365: Resting peacefully on the sandy bottom of Cayman Brac's north wall, lies the wreck of the 330 ft Russian Missile Frigate known as Destroyer 365. This former war ship is one of the most sought-after wrecks in the Cayman Islands, and the only diveable Soviet wreck in the Western Hemisphere. Built in 1984 as part of the Soviet Union's Atlantic Fleet, which operated out of Cuba during the Cold War, the $30 million USD war ship never saw military action. 1n 1993 she was removed from active duty and 3 years later acquired by the Cayman Island's Government to be deliberately sunk as a diving attraction. This impressive vessel now lies in crystal clear waters in depths of around 20-30 meters, with the radar tower just 6 meters below the surface. The ship's paint has given way to a dense covering of corals and algae, providing an artificial reef that supports a staggering assortment of fish, corals, sponges and other marine life. Turtles, sting rays, scorpionfish and morays are just some of the charismatic marine life that call this former war ship home. When wreck diving try your best not to make contact with the wreck. What may seem harmless to us, could destroy the fragile marine life that inhabitants this young artificial reef. This is also for your own safety as sharp metal and hazardous marine life could cause injury if touched. When penetrating the wreck, always follow the instructions and safety briefing given by your guide. Take a flashlight with you to peer into the holds, cabins and crevices of the ship where groupers and other predatory fish lurk in the darkness. The official currency of Cayman Brac is the Cayman Islands Dollar but as with elsewhere in the Grand Caymans, US Dollars are readily accepted. A Cayman Islands liveaboard trip is the best way to explore Cayman Brac's spectacular dive sites. Liveaboard diving allows access to some of the more remote and often inaccessible areas. 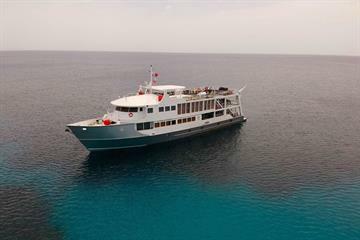 Multi-day Dive cruises depart from the capital George Town, located on Grand Cayman Island. Sailing the crystal clear waters of the Caribbean Sea, you will experience 8 days of unlimited diving at the best dives sites to be found across all three of the Cayman Islands. George Town on Grand Cayman is the main airport city of the Cayman Islands and also the point of departure for liveaboards. There are daily international flights into the Owen Roberts International Airport which is served by several airlines. Most flights arrive from various US cities and connecting flights are available, including Cayman Airways. Also a direct flight from London, UK is available with British Airways. Taxis are available for transport to and from the airport.